Ekiti State University Teaching Hospital, EKSUTH has started the sale of school of nursing application form for the 2018/2019 academic session, All who which to purchase the application form can now proceed to do so. b. The sale and submission of school of nursing ado ekiti admission application form will end on Friday, 24th August, 2018.
c. Keep your cards safe because the cards you obtain from the school is what you will use throughout the admission process, both for the entrance examination and interview results. once card is misplaced it will cost you much to get a new one. → Also those who wish to combine WAEC/SSCE with NECO Results are permitted to do so. Note: DO NOT make payment to any individual, or make payment to any personal account, to avoid LOST, pay only to the college account below. 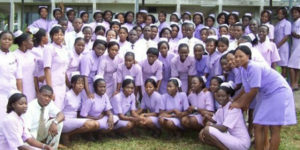 *Account Name: School of Nursing, Ado Ekiti. If You Need More Details Contact The Office Of The Principal, School of Nursing, EKSUTH, ADO-EKITI. Kindly Share With Others and Make Them Benefit From This Information By Clicking On The Facebook Share Button.